Cutter set Orchid Cattleya by My Thai Flowers at Thai City Deals. Hurry! Limited time offer. Offer valid only while supplies last. Cutter set Orchid Cattlea. Cutter set for artificial flowers. High quality Aluminum 7 cutters for sugar craft, wedding cake decoration, flower clay. Cutter set Orchid Cattlea. Cutter set for artificial flowers. High quality Aluminum 7 cutters for sugar craft, wedding cake decoration, flower clay. Will not rust. Shipping by air mail with tracking number for check a trip of your order. 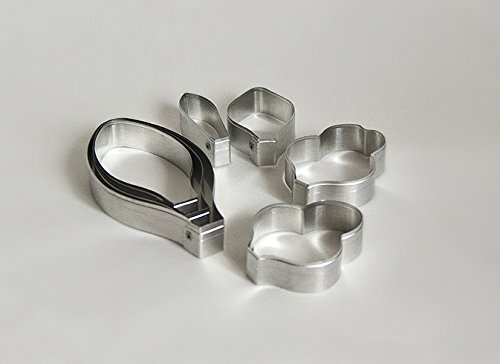 High quality Aluminum 7 cutters for sugarcraft, wedding cake decoration, flower clay. Shipping by air mail with tracking number for check a trip of your order. Cutter set tulip. Leaves and petals.